It’s 3am at your neighborhood dive. You’re winning at darts, the bartender just handed you a free shot, and by some miracle your group of friends has control of the jukebox. It’s dive bar heaven, save for one problem: You’re starving. You look to the popcorn machine as a last resort, but tonight it sits in lonely disrepair. Do you desert your darts? Jet from the jukebox? Your stomach roars. You have no choice but to end the night early and begin the search for late-night grub. Wait! Suddenly the door bursts open, a pool of light floods the hazy bar, and in walks your saving grace. 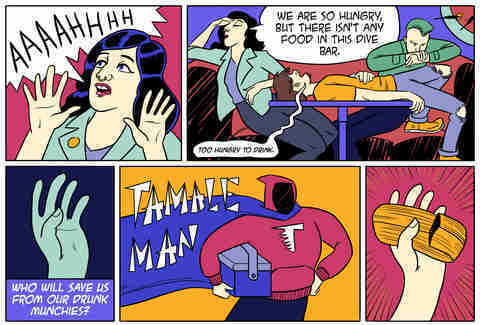 It’s Chicago’s Tamale Man. Rejoice! Delight! 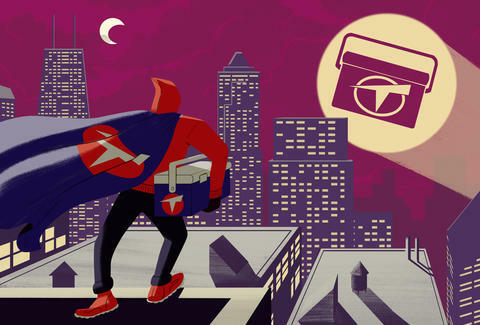 The night is saved! 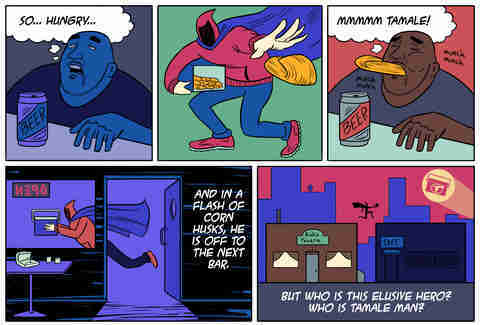 Most of what the internet holds about Chicago’s tamale men are urban legends or conspiracy theories. Some claim that Claudio is the only authentic Tamale Man because he’s been in the game the longest. Dig a little deeper though and you’ll read reports of an original original Tamale Man, who sparred with Claudio in tamale turf wars before stalking away from the scene forever. Most people don’t know the tamale men by name, but by colored cooler. Claudio is said to only ever peddle his wares from a red cooler, which sets him apart from Julio, who uses blue. Then again, there are a handful of scandalous reports of each man with the other color cooler, too. Gasp! People say Claudio’s wife makes his tamales. Others claim it’s his sister. Julio’s grumpy. Julio’s friendly. The path to true tamale knowledge is labyrinthine indeed. Many reporters have attempted to follow the corn husks to the source, but most call it a day after finding out one or two minor details or nothing at all. I was determined to buck the trend, to find out all I could about the world of late-night tamales and the men who sell them. Specifically, I was interested in the man, the myth, the tamale legend: Claudio. A month of evenings surveilling the Map Room, Flat Iron, Old Town Ale House, Weeds Tavern, Slippery Slope, and Cork Lounge all proved Claudio-less. I had picked my stakeout spots based on the trends I observed on Tamale Tracker. Heard of it? It’s the ingenious Twitter account someone after my own heart made up so that if you see a tamale man out, you can alert the city to his whereabouts and they can come running. All of these bars had come up on the site with good regularity, so I went a-looking. But nothing. “What makes him go to some bars and not others?” I wondered. Was it drink specials, beer gardens, proximity to pub trans? I couldn’t figure it out. “No!” I exclaimed, slumping down in my barstool. So close and yet so far! He gave me a curious look and I explained the saga. “Oh, well I can just text him if ya want.” TEXT HIM?! Claudio, our renegade dive bar delivery man, is on the grid?! “Uh yes. Yes, please.” “He’s responding right now. 20 minutes. He’ll be back.” Could it be that it was just that easy? Waiting for Claudio’s hypothetical return, I got cozy on my bar stool and chatted with my heroic bartender. Who was this guy and how did he come to have Claudio’s direct line? Everyone I talked to at Green Eye is just like Turbo: faithful to Claudio through and through. “Everyone else’s I’ve tried. I always just wait for Claudio… he’s got the goods,” says Sean Boban, the doorman. “The proof is in the taste,” Turbo says. “[Claudio] makes everything fresh. There are people who come in here and… I’m sure there’s a lot of old product being reheated. What Claudio does, he gives it away if he doesn’t sell it,” he says. Claudio’s salsa verde is another factor that keeps Boban and Turbo coming back to Claudio. “His hot sauce is so prized,” says Boban. Turbo’s got the real hookup: From time to time, Claudio will bring him a quart of the precious green elixir. But things aren’t always so friendly in Tamale Land. For one, the city isn’t always so hot on the whole idea. Boban explains that once or twice the news has done a story because “people who are walking around like that, they are not paying taxes for what they’re selling. There’s no regulation for their food.” A little friction, sure. But that hasn’t stopped the tamale men from doing their thing. According to Boban, although uncommon, turf wars are also real for the tamale men. “[A] door guy that I was talking to said that Claudio and another [tamale man] ran into each other at the same spot,” he recalls. “I don’t know if it was something to do with the tamales or something else, but apparently they got into a fight. Like a fistfight.” They both still come through the Green Eye. Luckily though, they rarely, if ever, overlap. The men have different styles of appealing to customers. While Claudio’s approach is personal, calling “Tamales!” as he strides table to table, other vendors are more aggressive. The aforementioned rare-occasions guy, according to Boban, “kinda forces himself upon people, like ‘Come on! You know you want some tamales.’” Others are more aloof, yelling “tamales, tamales” just above the din of the crowd to no one in particular. All of the tamales, from what I can glean, are made the traditional Mexican way: Mix the masa, make the filling, steam the cornhusks. Then spread the masa, fill, fold, and steam for an hour-ish. The texture depends on how much lard is in the dough, grease level on the filling, and size on your discretion. In Mexico, tamales can be eaten for breakfast or dinner, sold on the street or in a restaurant. They can also be savory or sweet. I haven’t encountered the sweet ones, but our Bucktown guy Ted has. “One time outside of the grocery in Logan Square I bought an entire [car] trunk of tamales,” he says. “A lot of them were strawberry tamales and let me tell you those were delicious.” Through more sleuthing I’ve determined that these tamales came from Alberto, who I met on the long road to Claudio, and who comes by the Green Eye a couple times a night. Like Claudio’s, Alberto’s business is a family affair. It all starts in the kitchen with his mother, whose pork tamales are no joke. They are bring-your-Tums spicy and that’s without the salsa. The masa is a little drier than some (less lard, probably) and is folded to form a cigar-sized cylindrical tamale. Alberto loves passing on praise to his mother and endearingly says that his favorite thing about selling tamales is introducing the public to his mom’s cooking. Although I would have put money on his least-favorite part being the drinkers that must accost him nightly, he says the low point of the job is simple: when he doesn’t sell as many tamales as he wants. Variability is part of the gig; on some nights he’ll do several circuits and still come home with a full cooler. On others, he can sell an entire trunkful. But enough about the other tamale men. Eyes back on the prize. Where was Claudio? I sat and waited, chatting with Boban, Turbo, Gerstle, and other bar patrons. Twenty minutes went by, 30, 40. And just as I was starting to despair, in he walked, signature red cooler in hand. A short man with a thin mustache and pleasantly round belly, Claudio is quick to smile. He has an easy, calm exuberance about him that makes his “tamales, tamales” feel like a warm invitation to join the party. Claudio made a beeline for Turbo. Within 10 seconds he’s at my table, opening the cooler: “Chicken, pork, or cheese?” he asks. “Oh man, they all look delicious,” I say, “but I’m actually writing a story” and explain my mission. At first, Claudio was dubious about chatting with a reporter. He said he’s working, maybe later, that he’ll give me his number. But I had come too far to not get the interview, and after a little coaxing he finally sat down and gave me the quick lowdown. “I’ve got a company, ‘Tamale Guy Chicago,’ it’s my business now. It’s me and my wife. [We use] my family’s recipe, my grandma’s,” he says. Of course, the recipe is a closely guarded secret. Intrigued by the turf wars Boban had mentioned, I ask Claudio (full name: Claudio Velez) about his relationship with the other tamale men. He says he doesn’t usually see anyone on the road. “Do you feel competitive with the other guys?” He shakes his head and scowls, “No, no.” Hmm, really? “They’re different tamales. Different everything. Every day I make these tamales. Not the other day. Only fresh tamales, they’re the best tamales,” he adds in a manner that’s not boastful but matter-of-fact. Claudio says he doesn’t have a preference for specific bars, but it’s hard for me to believe that’s true, because as he gets from his barstool with a “Have a good night,” Turbo comes over. “I came back to get some chicken ones,” he explains. Claudio gives Turbo a firm handshake and opens up his cooler. “This guy,” Claudio says, “This guy is my buddy. 20 years.” “20 years man,” Turbo nods. Eliza Helm is a freelance writer, actor, and improviser based in Chicago. She has taste-tested and fully endorses Turbo’s breakfast tamale hash.